Windowsills made of natural stone will highlight the interior of a room like no other material can. Marble, granite, and travertine are the most commonly used stones in the creation of interior sills. The raw material is quarried worldwide, but most of the fine-quality rock is found in deposits located in the Mediterranean region. Stonexchange is an importer and distributor of natural stone windowsills. We operate our own manufacturing centers, and we use the finest marble, granite, and travertine to fabricate luxurious windowsills for residential and commercial interiors. Our company imports material in bulk quantity, and we supply our products to contractors, retail merchants, and independent installers. Unlike most importers of natural stone, we do not purchase raw materials from brokers or third-party suppliers. We own the material outright, and we offer our clients the lowest wholesale prices in the industry. Stonexchange ships full-crate or full-pallet orders of natural stone windowsills from our distribution center in Florida to customers all across the nation. Marble and granite deposits vary in color, texture, and veining patterns. The actual look of the raw material depends on the composite rocks that formed the deposit over a period of millions of years. Some of the finest geological formations occur in or near a folded mountain range, where underlying layers of metamorphic and igneous rock have been thrust upward by the force of tectonic plate collision. Granite and marble are dense, extremely hard, and resistant to heavy pressure. The blocks cut from quarries are thinned into sheets using special cable saws or diamond dust blades. The sheets are cut into slabs, beveled or angled, and polished with dust or slurry. What started as an oblong slab of rock is now a beautifully crafted windowsill. 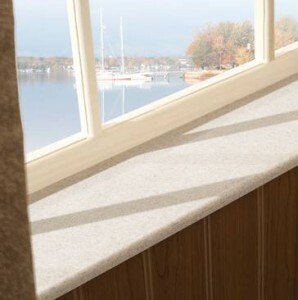 Stonexchange manufactures all standard size windowsills made from natural stone. We oversee the fabrication process as well as the importing of full-container loads of product. When these crates of windowsills arrive at our Miami distribution center, they are inventoried according to size, color, and style. Customers requiring a large number of these sills to complete an installation project can have their order processed and sent out on delivery in less than two business days. Our company can offer significant price discounts on full-pallet orders because we import material in such huge quantities. In fact, our entire import procedure is managed on a schedule that matches our customer orders. In this way, Stonexchange is a full-service turnkey operation, eliminating third-party brokers as well as multi-stage contracting for purchasing, freight, and delivery. The problem for installation contractors centers on product compatibility. If the contractor buys material in separate orders and in smaller quantities, matching color and styling becomes difficult. Depending on how the project is phased, unsuitable shade matches can occur even if the products are being installed in the same residential or commercial unit. Some importers of marble, granite, and travertine products maintain a huge inventory of stock but fail to separate different sets of incoming supply. Instead, they spend an excessive amount of labor gathering product together and attempting to match color and style according to the codes written on the bottom of the sills, thresholds, tiles, or other accessories. This can drive up the final cost of product, meaning the per-piece price is similar to what a consumer can expect to pay at a retail outlet. Stonexchange takes raw material from a single quarry site and fabricates tens of thousands of sills that are very similar in color and patterning. Customers who order from us can expect perfect shade and style match. This is important not only for matching windowsills in terms of color, but it also is important when matching color and style between different products. Our natural stone windowsills will perfectly match our other products, namely tiles and thresholds. This results in less time spent by the installer who needs to find similarly styled sills, saddles, and floor tiles for a particular room interior. Buying in bulk also means that all materials needed for a complete project phase are already on hand, with no need to purchase additional product on an irregular schedule. Our company ships product by overland freight to any commercial address. We deliver full-pallet orders of windowsills to construction sites, merchant outlets, and storage facilities. 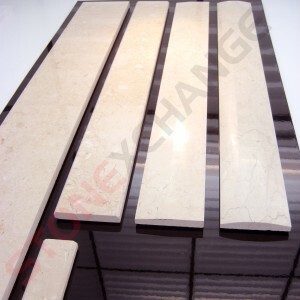 Unless the order specifies non-standard lengths, widths, or thicknesses on our windowsill products, the order can be sent as a set of crates from our Miami distribution center.Beautiful Sills Made from Granite or MarbleStonexchange offers the best wholesale pricing on minimum piece count orders. Our team of marketing experts has determined the most sought-after products used in the construction/remodeling industry, with the result being a full inventory of windowsills guaranteed to match nearly any design specifications. Customers are encouraged to take a look at our company here for exact pricing on our window sills, thresholds, soap shelves, shower seats and more!